A 6.4 Magnitude Earthquake Struck the Kingdom of Tonga. | Chaos Sweeps Away the World We Know! The Disaster, current events & Catastrophe Blog. Forecasts for 2014 to 2022. Read tomorrows news today! Plus current economic, commodities, stock indices and financial news. ← Another Earthquake in Paradise – Vanuatu Struck by a 6.1 Magnitude Tremor? September 5, 2011 – A 6.4 Magnitude Tremor Hits Tonga: The quake struck at 10:52PM at the epicenter, at a depth of 35 kilometers (21 miles). No tsunami warnings have been issued. The quake struck at 5:52AM in New York (EDT), 4:52AM in Chicago (CDT), 3:52AM in Denver (MDT) and 2:52AM in Los Angeles. 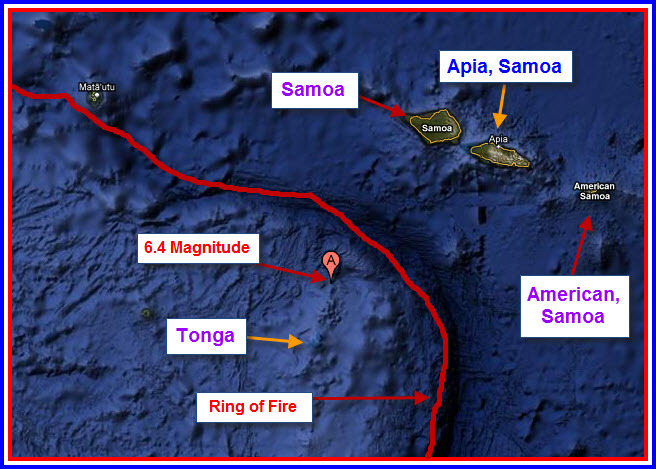 The quake was 45 miles NNE of Hihifo, Tonga; 157 miles south-west of Apia, Samoa; 202 miles WSW of Pago Pago, American Samoa and 1,648 miles NNE of Auckland, New Zealand (see map). The State of Samoa gained independence from New Zealand in 1962, with it’s capital being Apia, Samoa. American Samoa is an Unincorporated Territory of the United States, and it’s capital is Pago Pago. The Kingdom of Tonga gained independence from England in 1970. It’s capital is Hihifo. This entry was posted in American Samoa, New Zealand, Samoa, The Kingdom of Tonga, United States and tagged american samoa, apia samoa, auckland new zealand, Earthquake, hihifo tonga, pago pago american samoa, quake, ring of fire, september 5 2011 earthquake, state of samoa, the kingdom of tonga, The Master of Disaster, The Ring of Fire, tonga 6.4 earthquake, tonga september 5 2011 earthquake. Bookmark the permalink.